Almost a month has passed since an enquiry was demanded into the alleged scam involving appointment of 32 candidates at the Srinagar-based Veer Chandra Singh Garhwali Government Medical Science and Research Institute, outsourced from Uttarakhand Purv Sainik Kalyan Nigam Limited (UPNL), but the issue has still not received any attention from the authorities concerned. The famous Jhanda fair will begin on Friday with tight security arrangements at the historic Guru Ram Rai Darbar. Thousands of devotees from across the country are expected to throng the illustrious fair. Former Chief Minister BC Khanduri has extended his wishes to the devotees who have arrived in Dehradun to take part in the annual Jhanda Mela. Padma Bhushan Kunwar Singh Negi, pioneer of the Gurumukhi literature for the blind in India and abroad, passed away in Dehradun today. He was keeping indisposed for quite some time. Waking up to the widespread encroachments on the Rajpur Road, the Dehradun Municipal Corporation (DMC) finally sprung into action here today. To review the state of Gangotri National Highway in the wake of the forthcoming Char Dham Yatra beginning in the first week of May, Chief Secretary Subhash Kumar visited the area to check the ongoing repair works being carried out. The members of the National Students Union of India (NSUI) led by town president Ritesh Rawat met Manmohan Singh Mall, chairman of the Mussoorie municipal college committee and demanded employment generating courses in MPG College from the new academic year, here today. Mussoorie, March 20 More than dozen villages in the Chaijulla Patti under Dhanaulti Assembly segment in district Tehri are waiting basic amenities even after 65 years of Independence. Ramesh Pokhriyal Nishank, BJP candidate from the Haridwar constituency, started campaigning for the Lok Sabha elections today. In the first leg of the campaign, Nishank, legislator from the Doiwala Assembly segment, is trying to regroup, unite party workers and and infuse enthusiasm in them. The Congress seems to have already lost the battle for the Pauri Garhwal Lok Sabha seat much before the party hits the campaign trail in the constituency due to sitting Congress MP Satpal Maharaj's reluctance to contest despite several efforts of persuasion. 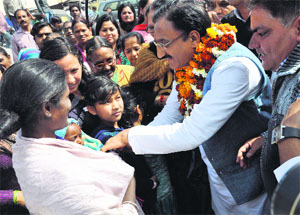 Supporters of Ramesh Pokhriyal Nishank, former Chief Minister and BJP's Lok Sabha candidate from the Haridwar constituency, today organised a roadshow from his residence on the Tyagi Road in Dehradun to showcase support to him. The BJP is facing a tough challenge on both seats of Kumaon division, as its rebels—Bachi Singh Rawat and Sajjan Lal Tamta—have decided not to support party candidates fielded from Nainital and Almora. Ganesh Joshi, MLA, Mussoorie, told mediapersons here today that the Narendra Modi wave had now became a political tsunami in favour of the BJP and the party would win all five Lok Sabha seats in the state. Where mainstream parties are busy galvanising support for the forthcoming elections, a large number of new parties have suddenly emerged on the national political landscape. But, if political pundits are to be believed, they will not be able to make a dent in the vote share of either the Congress or the BJP. The Table Tennis Federation of India has nominated Prince Vipon, posted at Summer Valley School in Dehradun, as the technical official for the upcoming international table tennis events. The Dehradun-Purkul-Mussoorie ropeway project still awaits clearance from the Centre and the state government as the work on the project was scheduled to start on May 15, 2013. The 127 Eco Task Force began the project of tree plantation in the remote areas of Jaunsar and Bhabhar in Dehradun district under the stewardship of Col KS Jaggi, commanding officer of the force. The Eco Task Force planted large number of saplings in the region, yesterday. Mussoorie, March 20 According to the Mussoorie police, some unidentified thieves decamped with Euro number plates from around 14 cars overnight of which two were private vehicles and others taxis at Kempty stand, Hussain Ganj and Library bus stand area. Dehradun, March 20 Thieves broke into a locked house at Puribiya Colony in Vikasnagar police station area on Wednesday night. They took away cash and valuables worth lakhs of rupees. Judicial magistrate AK Srivastava at the Gangolihat munsif court today sent a private school owner, Chandra Singh Karki, accused of sexually assaulting girl students to judicial custody for 14 days. “The judicial magistrate at Gangolihat has sent the accused to judicial custody for 14 days,” Harish Punetha, advocate for the victims, said. A two-day workshop on ‘Gender Sensitisation and Crime against Women’ concluded at Dehradun police lines here today. Additional Director General of Police (ADG) Ram Singh Meena was the chief guest on the occasion. A hasya kavi sammelan was organised on the second day of the ongoing student’s week celebrations at DBS PG College here today. A large number of students turned up for enjoying the hilarious session. Speaking to The Tribune, Lt Gen Badhani (retd) said that there is a strong indication that these 32 appointments were made by flouting norms. “Ever since the scam was reported I had written twice to the Uttarakhand Chief Minister Harish Rawat seeking an enquiry. In fact the Chief Secretary Subhash Kumar had called up and asked for the documents related to the scam. However, he was told that the documents are with Brig Bahuguna (retd), Director of the Directorate of Sainik Kalyan. Since then nothing has been done,” he added. “I have a strong hunch that the documents related to the appointments might be fudged or compromised to hush up the matter in connivance with somebody from the higher authorities in the Directorate and the state government. That is why I had demanded an enquiry from an outside agency,” the chairman added. “On one hand the Congress is pressing for a corruption-free India and on the other hand, the state government being led by Harish Rawat is doing nothing to resolve the issue that has the sentiments of ex-servicemen attached to it. Till date neither the documents have been seized nor sealed to prevent its misuse. This is a clear indication that the authorities are trying to hush up the matter,” added Lt Gen Badhani (retd). It may be recalled in a letter shot on February 20, the chairman had requested the CM for an enquiry into the alleged irregularities during the 32 appointments made in the institute by UPNL in 2013. In a letter, the chairman not only requested for an immediate enquiry but also demanded the suspension of UPNL Managing Director Brig AN Bahuguna (retd) so that he is not able to influence the enquiry. The appointments were made at the time Brig Bahuguna was heading the nigam. It was also requested that the enquiry be conducted from an outside agency so that either the employees of UPNL or the Directorate of Sainik Kalyan could not influence members of the enquiry team. The issue of irregularity came to light when in January members of Sanyukt Karamchari Mahasangh objected to the 32 appointments made on contractual basis in the Medical College, outsourced from UPNL. The objection was being raised on the basis that joining was done nearly nine months after the issuance of contract letters. As per the rules, the contractual employee has to join within a month of issuance of contract letter, failing which the offer stands cancelled. In this case the joining letter was issued in May 2013. It may also be mentioned here that Secretary, Medical Education, had placed a ban on the institute for outsourcing the employees in October 2012. However, following a request from the college authorities UPNL had issued 32 fresh appointment letters in May 2013. Formed in 2004 with an aim to provide employment to the ex-servicemen and their dependents in Uttarakhand, UPNL has been outsourcing for various government departments and private players since then. The appointments made via the nigam are on contractual basis. Though the priority is given to the ESMs, a government order has been issued to cover the civilians as well. Over 150 policemen will be deployed in and around the venue for the next fortnight with the Quick Response Team (QRT) manning the most crowded places and keeping a close vigil on suspicious elements. Besides constables, 17 sub-inspectors and 20 head-constables will also be a part of the overall security arrangements. 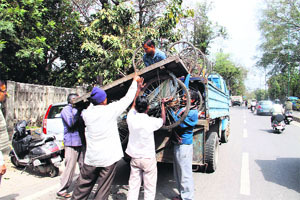 head and manage the security of the fair till April 8,” said Vipin Chandra Pant, In charge of Kotwali police station. For the constant electronic surveillance, the management of the Guru Ram Rai Darbar has also installed 22 CCTV cameras at selected places to monitor all the activities in the fair. The Jhanda Fair is held on the fifth day after Holi every year. The fair is celebrated in the memory of Guru Ram Rai, who established Dehradun city with thousands of devotees, especially from Punjab and Haryana. Mahant Devendra Dass Maharaj delivered guru manta to the pilgrims of the east here today. The former Chief Minister also extended his wishes to Kumari Reena Maithani for standing first in the essay writing competition organised by the National Women Commission in the Ukhimath block in Rudrapur. Born in Pauri Garhwal district in 1927, Kunwar Singh made several books available for the blind in Braille. He retired as Braille editor from the National Institute of Visually Handicapped, Dehradun. His biggest contribution was transcribing the Gurmukhi in the Braille script titled “Bani Nitnem” and also the “Sukhmani Sahib”. His work received recognition from the Union Government and he was awarded the Padma Shri in 1981 and Padma Bhushan in 1990. Shri Gurudwara Prabhandak Committee had bestowed Sikh Gaurav award to him. He was also closed linked to Bharat Netrahin Samaj, Punjab, and National Federation of Blind in Delhi. As part of their anti-encroachment drive, a team from the DMC removed encroachments from the Regional Transport Office up to Jakhan. Besides clearing encroachments adjacent to the platforms and on the roads, the officials also warned the erring shopkeepers and kiosk owners of stringent action in case they were found encroaching upon the area again. In a press note issued here it was stated that the CS reviewed the route from Harshil to Maneri by road and gave directions to repair the damaged patches before the yatra begins. The Public Works Department and Border Roads Oragnisation are carrying out the repair and road widening work of the damaged highway. The work from Harshil to Bhatwadi is being carried out by PWD whereas work from Bhatwadi to Maneri is also being undertaken by PWD. be provided with adequate machines so that the road can be cleared in case of any disaster,'' he added. Additional Chief Secretary Rakesh Sharma said that there has been an increase in the compensation amount. He added that Bhatwadi is a landslide sensitive zone and experts have given advice to displace people from their areas. Manmohan Singh Mall is also the chairman of the managing committee of the college. Rawat presented a memorandum to Mall, seeking more employment generating courses for the students here. 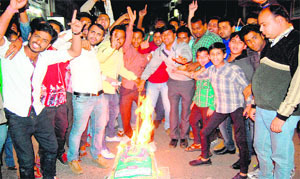 Ritesh Rawat said they have been demanding introduction of professional courses from past several decades, but their demands have not been met as yet. “Mussoorie is a famous tourism spot, but there are no courses related to tourism in the college due to which the students, who belong to poor strata of the community are forced to look for better avenues elsewhere, which is not only cumbersome exercise but expensive too,” said Rawat. Presenting the memorandum, Rawat demanded introduction of courses such as Hotel Management, Mass communication and Tourism in the college from the new academic year. Mall assured the NSUI members, that he would speak about the problem with the concerned authorities and try to resolve the problems of the students on priority basis. However, the members of Akhil Bhartiya Vidyarti Parishad (ABVP), the opposing student group affiliated to BJP, termed the meeting as only an election gimmick. The ABVP student leaders said if the NSUI members had shown the same interest in fulfilling the other demands of the student earlier, a headway could have been made so far. More than dozen villages in the Chaijulla Patti under Dhanaulti Assembly segment in district Tehri are waiting basic amenities even after 65 years of Independence. The villagers from the region have been demanding adequate health, road connectivity, education, drinking water facilities from the concerned authorities but all such pleas have fallen on deaf ears so far. Around one dozen villages, Kolti, Malwana, Ladur, Kimoi, Kapolti,Tuneta,Jhinsi, Baman Gaon etc are still awaiting a motorable road to their villages since Independence. In this regard on a daily basis the former Uttarakhand Chief Minister is holding meetings with party leaders and workers. He has temporarily made the city party office at Devpura his election office and is reviewing the campaign progress. Three-time legislator Madan Kaushik, who was also among the claimants for the BJP ticket from Haridwar, is angry at the allocation of ticket to Nishank. He has been absent from Nishank’s campaign. However, Nishank has been able to garner support of four other legislators from the district. Haridwar rural Assembly segment Swami Yatishwaranand, Ranipur-BHEL MLA Aadesh Chauhan, Lakshar MLA Sanjay Gupta and Jwalapur legislator Chandrasekhar Bhattewalla have expressed their support and faith in Nishank’s candidature. This has boosted former CM's candidature and party activists too seem to be happy with the party high command’s decision. Now,they feel they can really retain Haridwar seat, which was held for three consecutive terms in the 90s by party candidate Harpal Sathi. Addressing party workers at the city office, Pokhriyal said that all of them should start reaching voters as the party has reposed faith in his abilities, while he himself is banking on the work of party workers. Nishank added that along with Haridwar seat, the BJP will win from other four constituencies also, Pauri Garhwal, Tehri Garhwal, Almora-Pithoragarh and Naintal-Udham Singh Nagar. Refuting any major resentment within the party rank and file, the six-time legislator said that if any one has any issues he is open to express with the party high command but should abide by the decision as no one is above the party. Nishank said that he never vied for MP ticket as he had been busy with the work in his Assembly segment in Doiwala, but it was the party high command's decision to field all three former CMs BC Khanduri (Pauri Garhwal), Bhagat Singh Koshyari (Nainitial) and he himself. “Whatever the party says should be final for all of us, be it a minister, MP, legislator, Cabinet ranked, senior or grass-root worker. The time is to strengthen BJP to reach 272 plus figure, otherwise neither the party nor the public will pardon the violators. Satpal Maharaj is the sitting MP from Pauri Garhwal and he has categorically announced not to contest the parliamentary elections this time. He has even denied that any of his family members could contest in his place. Though he won only twice, Satpal Maharaj has contested from the Pauri Lok Sabha seat for a staggering seven times in the past. In the last 2009 parliamentary polls, Satpal Maharaj defeated Lt Gen TPS Rawat (retd) by a margin of 17,397 votes. Maharaj had polled 2,36,949 votes while Lt Gen Rawat secured 2,19,552 votes. Ever since polyhouse subsidies irregularities were raked up in the state and Opposition in particular targeted Satpal Maharaj’s wife and Cabinet minister Amrita Rawat for her involvement, Maharaj has not been having good relations with the Chief Minister Harish Rawat. The matters became worse when Harish Rawat while distributing portfolios to his ministers did to give horticulture to Amrita Rawat, the department held by her in the Vijay Bahuguna government. A war of words that subsequently erupted between Satpal Maharaj and Harish Rawat caused much damage to the Congress. However, in efforts to placate Satpal Maharaj, Chief Minister Harish Rawat in public admitted to committing an error by not giving Horticulture Department to Amrita Rawat. But a reluctant Satpal Maharaj has refused to contest this time. He has made it amply clear that even his family members will not contest the Pauri Lok Sabha seat, leaving no room for compromise. Maharaj has even made his intention clear and conveyed the same to UPA chairperson and Congress president Sonia Gandhi. Maharaj has reportedly offered his services to campaign for the party across the country instead of being a party candidate for Pauri Lok Sabha seat. While last ditch efforts are still under way to convince Maharaj to enter the poll fray, Satpal Maharaj’s reluctance has caught Uttarakhand Congress completely off guard. It will be extremely difficult for Congress to come up with an alternative choice. First to come up with a new candidate and then to ensure that Congress rank and file in the constituency support him will now be a very tough task for Congress. However, there are reports that Congress Kotdwar MLA Surendra Singh Negi is likely to contest if all efforts to persuade Satpal Maharaj to contest fail to yield results. 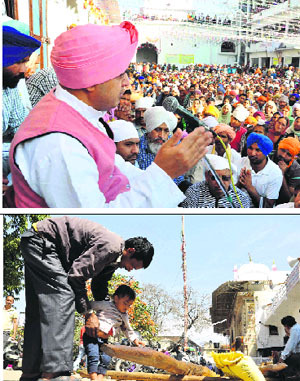 But ensuring support of Satpal Maharaj to a new Congress candidate does not seem forthcoming. The BJP has already announced former Union Minister Maj Gen BC Khanduri (retd) as its candidate from the Pauri Lok Sabha seat. This seat has been the traditional seat of Khanduri, who has represented it in 1991, 1998, 1999, 2004, defeating Saptal Maharaj. But the contest between the two political rivals has been bitter at times. The Congress think tank, too, admit that taking into account the popularity of former Union Minister and former Chief Minister BC Khanduri, no other Congress candidate other than Satpal Maharaj will be in a position to give a contest to Khanduri. But the uncertainty that lingers over Congress candidate for Pauri Lok Sabha seat is bound to damage the party for which every seat counts in the state. The roadshow passed through Race Course, Deep Nagar, Clement Town, Deep Nagar, Mothrowala, Banjarawala, Kargi, Turner Road, Chandrabani, Transport Nagar, and Niranjanpur Chowk before culminating at Bhandari Bagh. Mayor Vinod Chamoli, Neelam Sehgal, Prakash Suman, Umesh Aggarwal, Punit Mittal, Laxmi and Satish Kashyap took part in the roadshow. Rawat, however, reiterated his support to the party for which he claimed being a member of Rs 5 only. He said he was preparing his grounds in Nainital, as the party high command had told him that he would be given another chance to contest from the seat. “I am deeply hurt. So much that even if the party makes me the manager of the election management committee, I will not go to Nainital to campaign in favour of Koshiyari,” Rawat told the media at Ranikhet today, adding that his vote and support would be with the party. On the other hand, Sajjan Lal Tamta, a senior RSS functionary from the Kumaon region and a claimant for the party ticket from Almora resigned from the primary membership of the BJP, protesting non-inclusion of his name in the party panel sent from the state as a prospective candidate. He was also against the inclusion of Rekha Arya, who according to him is a new entrant in the party. “I have decided that I will contest independently from Almora,” Sajjan said during a press conference at Haldwani today. He said despite being attached with the RSS from his student days, he was not considered from Bageshwar and Someswar Assembly seats. He said, like other parties, the BJP too had started giving importance to money and muscle powers. “The grassroots level workers are not respected in the party,” he said. Senior BJP leader Bishen Singh Chufal, however, tried to pacify Tamta by paying a visit to his house at Narsinghbari in Almora town today. “I have sent his grievance to the party high command and have requested the party not to accept his resignation,” Chufal. Joshi said Tehri Garhwal MP Mala Raj Lakshmi Shah had gained an important lead from the Mussoorie Assembly segment in the Lok Sabha byelection when she defeated former Chief Minister Vijay Bahuguna’s son Saket Bahuguna. He added Mala Raj Lakshmi would get an unprecedented lead from the Mussoorie segment this time also and win the parliamentary election with a handsome margin. He said the fear in the Congress of losing the parliamentary elections was evident as its senior leaders were shying away from contesting against the BJP candidates. Joshi said the work done by him in the constituency would come handy for Mala Raj Lakshmi and increase her victory margin in the election. The Jai Maha Bharat Party, which was founded in 2008, has decided to field its candidates in Uttarakhand, Uttar Pradesh and other states. The party, in mere six years of existence, claims to be a national party. While, the Congress is facing a crisis in finalising its candidates in the state, the Jai Maha Bharat Party has no such issues. The party has named candidates from all five seats in Uttarakhand. So far, the party has officially announced Diwakar Chaudhari from the Haridwar constituency, Dr Nazim from Bijnore, Nitin Kumar Tyagi from Sonipat, Mukesh Kapil from Sambhal and Arvind from Saharanpur. As per JP Sahi, spokesperson of the Jai Maha Bharat Party, the list of candidates from various other states and constituencies would be released soon. He claimed that the party evinced good response from voters. Sahi said the party was banking on its manifesto, which covers issues such as corruption, education, health and communal harmony. He said other parties have a vision of one Bharat (India), but we want the overall development of India, hence the name Jai Maha Bharat. He said in Uttarakhand, none of the parties, including the NCP, Shiv Sena, RJD, RLD or even the Samajwadi Party or the BSP, have been able to make a dent in the vote share of the Congress or that of the BJP. “Hence, one can imagine the fate of these parties in the Lok Sabha elections,” he said. Prince Vipon, who is a SAI table tennis coach as well, has been a technical official for a number of international events, including the Commonwealth Games, 2010, World Junior Championship, Indian Junior and Cadet Open. The Uttarakhand Table Tennis Association has extended the wishes on his nomination. The ropeway project was decided to boost tourism in the state. The residents of the town are agitated over the inordinate delay and the state government for not initiating the project on priority basis. Piyush Jain, project manager, said the project had been sent to the Ministry of Environment for clearance. He said some queries were being sought by the ministry for which the reply was being prepared and would be sent soon. The project also awaits a green signal from various state departments, thus resulting in delay in the project. The project covers a distance of approximately 11 km. If completed, it would be the longest ropeway project in Uttarakhand. According to the Uttarakhand Tourism Development Board (UTDB) officials, several activities such as eco-tourism, paragliding club, theme parks and luxury and budget hotels were also proposed under the project in order to boost the local business and generate employment for the youth of the region. The ropeway project being developed under the PPP model initially was estimated at a cost of Rs 500 crore a few years back, but due to the unwarranted delay the cost rose to Rs 900 crore and could rise even further. “The design of the ropeway project will not cause damage to trees along its route,” said a UTDB official. Former chief secretary Alok Kumar Jain had reviewed the progress of the project in a meeting held in May 2013. He had also directed the officials to speed up the process, but it has not inched a step further since then. The residents and local businessmen of the town are of the view that instead of wasting time and money on the project which is yet to take off, the government should focus on other viable projects to boost tourism in Mussoorie. 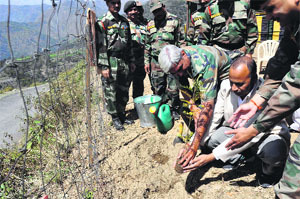 The 127 Eco Task Force began the project of tree plantation in the remote areas of Jaunsar and Bhabhar in Dehradun district under the stewardship of Col KS Jaggi, commanding officer of the force. The Eco Task Force planted large number of saplings in the region, yesterday. The project with its base at Kauthi Bhaundi was attended by a number of dignitaries including, Ram Gopal Verma, DFO, and Shivraj Chand, SDO of the Kalsi forest division. Col KS Jaggi said the main aim of the project was the ecological development of the area and to improve the ecological balance of the state and the country. He said the plantation area was located in the Kalsi forest division and will cover approximately 2,000 hectares of civil soyam land that would include plantation, soil conservation and development of grasslands. The proposed species of trees and shrubs include Bhimal, Kharik, Tun, Siras, Shisham, Sagwan, Akhrot, Chulu, Walnut, Banj etc.Col KS Jaggi said Lt Col Mayank Dhasmana will oversee the project. He said the Eco Task Force had been involved in planting trees in the barren areas of Mussoorie and Aglar watershed region in the past. According to the Mussoorie police, some unidentified thieves decamped with Euro number plates from around 14 cars overnight of which two were private vehicles and others taxis at Kempty stand, Hussain Ganj and Library bus stand area. Thieves broke into a locked house at Puribiya Colony in Vikasnagar police station area on Wednesday night. They took away cash and valuables worth lakhs of rupees. The anti-human trafficking team of the Nainital police arrested Karki (70) from his house in the city yesterday on the charge of sexually assaulting girl students residing at his school hostel at Berinag in Pithoragarh district. SSP, Nainital, Vimmi Sachdeva, had ordered a probe into the matter after she received a video clipping from the victim students last week. “The anti-human trafficking team of the Nainital police conducted a detailed inquiry in the matter and arrested Chandra Singh Karki under Section 376 of the IPC and other laws for sexually exploiting girl students residing at his school hostel at Nainital for the last seven years,” said DL Verma, in charge of the anti-human trafficking cell of the Nainital police. According to the police, Karki always introduced himself as a statehood activist. He had even contested the Assembly election from the Didihat seat as an Independent candidate in 2007. He had retired as a government intermediate college lecturer. The ADG along with Deputy Inspector General of Police (DIG) Garhwal, Amit Singh and other senior police officials showcased the posters and pamphlets displaying the women helpline number: 1090, which will be distributed across the state by the police. The Sambhav Manch Parivaar also performed a play on the issue of crime against women. Over 100 female and male police personnel from across the seven districts of the Garhwal range participated in the workshop. Experts from other fields also addressed the participating police personnel and spoke on various issues related to crime against women. Gyandendra Kumar of Empower People organisation spoke on women empowerment. Ramendri Mandrwal, former women protection officer spoke about child abuse and other women related issues. DIG Amit Sinha, SP Crime Nivedeta Kukreti, ASP Mamta Vohra and CO Mussoorie Jaya Baluni were also present on the occasion. Local MLA Ganesh Joshi was also present during the kavi sammelan. The college teachers and other staff members were also present. 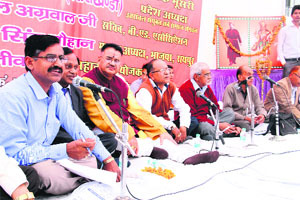 Besides kavi sammelan, a number of other activities were also organised on the occasion. Rangoli and poster painting competition were organised on the first day of the celebration. An orchestra performance will also be organised during the celebrations.